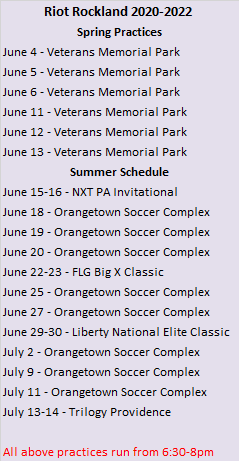 The Riot Rockland teams for Summer 2019 comprise teams in graduation years 2020, 2021, 2022 and 2023 . 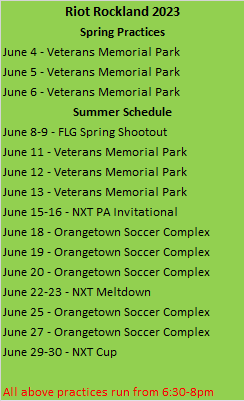 Our tryouts are held in mid-July of every year for the following Summer. All tryout fees and tuition payments for our Fall and Summer teams are non-refundable. Email: barry@njriot.com if you would like to be placed on our email list for future informational e-mails about tryouts and clinics. Starting in Summer 2021, Riot Rockland will field youth teams in grades 4-7. Our tryouts are held in mid-July of every year for the following Summer. All tryout fees and tuition payments for our Fall and Summer teams are non-refundable.